Guest who have a diner in the restaurant and have book directly we offer a bottle of wine in the restaurant. The old hotel lobby has been transformed in a place to eat&drink. We offer breakfast, lunch and dinner, inside or outside on the terrace. You can enjoy a delicious coffee with homemade pastries of have a drink and a snack. Our meals are prepared in the traditional way, using fresh and local products. TEUN is situated in a lively street with shops en cosy little restaurants. The Jordaan is just around the corner. Nearby you can find lots of attractions. Central Station is a15 minutes walk or 2 busstops away . Parking is possible in the street or in public garages nearby. TEUN opened recently and is a cosy little hotel with rooms and a restaurant. It is situated in an old, characteristic 17th century building that is officially listed as monument. It can be found at the heart of Amsterdam, in Haarlemmerdijk. 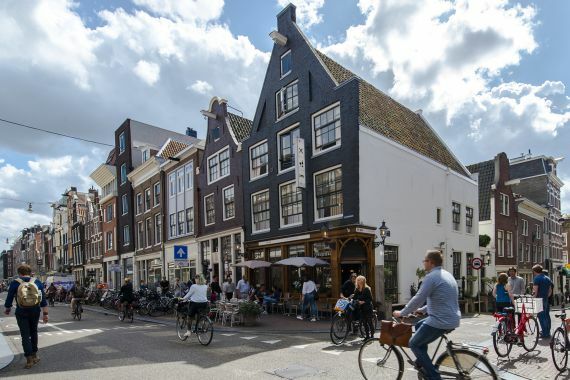 This street has been officially named as one of the most attractive shopping streets in The Netherlands and is right around the corner of the atmospheric Jordan quarter with lots of shops, bars etc. and the dynamic Westerpark, where lots of events take place. Starting January 1, 2019 a tourist tax of 7% will be applicable.